Spanish theologian of the fifteenth and sixteenth centuries. He lived for a time in Portugal, where he associated with Joseph Ḥayyun, who inspired him with that taste for mysticism which he subsequently displayed in his writings. When the Jews were banished from Spain Jabez settled at Mantua, Italy. There he met his compatriot, the cabalist Judah Ḥayyaṭ, whom he induced to write the commentary "Minḥat Yehudah" on the cabalistic work "Ma'areket Elahut." Jabez was an opponent of philosophy. For him the truth of the Jewish religion is demonstrated by the miracles recorded in the Bible. He criticizes the thirteen articles of faith of Maimonides, the six of Ḥasdai Crescas, and the three of Albo. According to him, only the following three, alluded to in the verse "I am that I am" (Ex. iii. 14), are the fundamental principles of Judaism: (1) that God is one; (2) that He governs the world; (3) that in the end all mankind will believe in His unity. These dogmas are expounded by him in the following books: "Ḥasde Adonai" (Constantinople, 1533), an ethical work wherein the author demonstrates that the wise man is more grateful to God for his misfortunes than for worldly advantages; "Ma'amar ha-Aḥdut" (Ferrara, 1554), on the unity of God; "Perush 'al Masseket Abot" (ib. 1555), on the sayings of the Fathers, mentioned by the author of "Yesod ha-Emunah"; "Or ha-Ḥayyim" (ib. 1555), against philosophy; a commentary on the Psalms (Salonica, 1571). 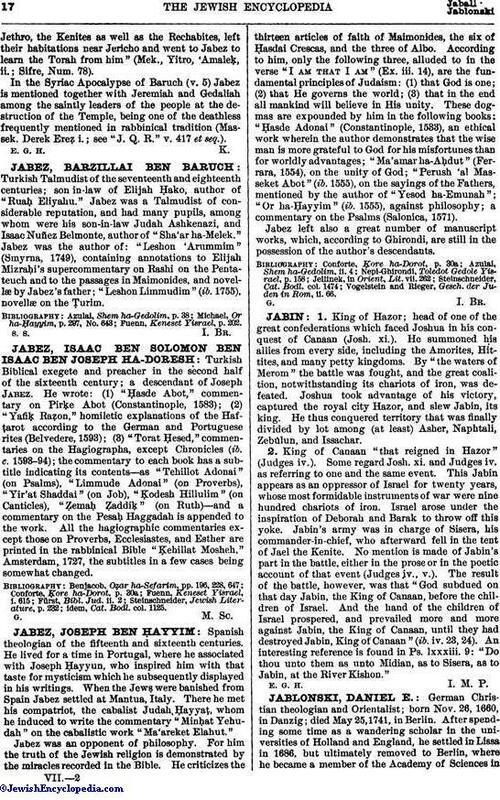 Jabez left also a great number of manuscript works, which, according to Ghirondi, are still in the possession of the author's descendants. Vogelstein and Rieger, Gesch. der Juden in Rom, ii. 66.